Smart Adapters provide a Tealware I/O Interface to remote I/O drops over Ethernet, connected to any SoftPLC controller or other controller that supports ModbusTCP. Where the I/O needs to be physically distributed, when there are more points than available for a local I/O SoftPLC, or where the control system CPU is not a Smart SoftPLC (eg: a SoftPLC Hardbook or non-SoftPLC controller), then Tealware modules can be used with Smart Adapters on ModbusTCP Ethernet in a wide variety of configurations, with up to 127 remote I/O drops of up to 24 modules per drop (up to 3K modules / 97K I/O points!). 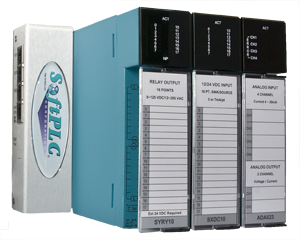 Tealware I/O can be used to replace or add I/O as part of an A-B PLC Migration / Upgrade process. Backplane3: Any three (3) Tealware modules can mount directly onto a Smart Adapter equipped with a Backplane3 Interface. 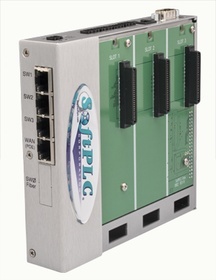 LocalPorts: If more than (3) modules are needed at a location, a Smart Adapter equipped with a LocalPorts Interface is used to connect to up to (3) I/O Bases. I/O Base Expansion Cables, available in 2', 4', 6' and 10' lengths, connect from the Adapter to an I/O Base (as well as from I/O Base to I/O Base). 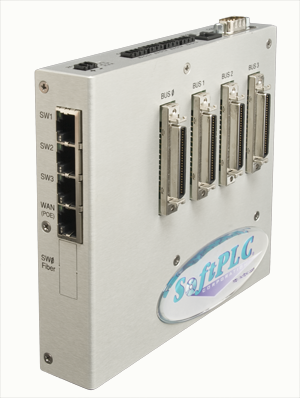 The Adapter comes with a DIN-rail mounting bracket, an optional panel mount bracket can be used with the LocalPorts version to mount the adapter with the Ethernet ports facing forward.